How Many Fish Are Caught Illegally? Here I continue an on-going series on IUU fishing. Last time I wrote on just what IUU fishing is. Now I turn to the scale of the problem and explore explanations for it. So how big of a problem is IUU fishing? The FAO recently reported that worldwide marine catches for 2009 amounted to 79.9 million tonnes. This means that illegal and unreported fishing accounts for between 12 and 25 percent of the world marine catch! So why is IUU fishing so pervasive? The rather dumb answer I get from the literature is that the underlying reason for IUU fishing is “economic”. That is, people are looking to make a buck. But really, is this “explanation” at all helpful? After all, there are many good people in the world who would never choose to steal, even from the take-a-penny jar. And city crime often tends to occur in geographic clusters. But where the sociology, economics, and other social sciences are fairly well advanced in understanding terrestrial crime, that of IUU fishing is just beginning to develop. 1. Weak governance. In short, weak political systems and lawless areas will fall prey to a sort of “hyper” tragedy of the commons. Agnew et al found a significant relationship between illegal and unreported fishing and World Bank governance indicators. These indicators include measures of public sector management, private sector competitiveness, the structure of government, civil society participation and voice, and political accountability. I laughed off my parents’ argument that if the government ever laid down its arms all hell would break loose. Our competing predictions were put to the test at 8:00 A.M. on October 17, 1969, when the Montreal police went on strike. By 11:20 A.M. the first bank was robbed. By noon most downtown stores had closed because of looting. Within a few more hours, taxi drivers burned down the garage of a limousine service that competed with them for airport customers, a rooftop sniper killed a provincial police officer, a doctor slew a burglar in his suburban home. By the end of the day, six banks had been robbed, a hundred shops had been looted, twelve fires had been set, forty carloads of storefront glass had been broken, and three million dollars in property damage had been inflicted, before city authorities had to call in the army and, of course, the Mounties to restore order. This enabling factor also jives well with anecdotal stories of IUU fishing, such as that coming from West African countries. 2. Lack of political will. We can also say that IUU is a big problem because very few countries are trying to stop it. All member countries of the FAO, for example, have signed on to the FAO Code of Conduct for Responsible Fisheries, which has important illegal and unreported fishing provisions. And yet, a review of compliance with these provisions found that, 30 of 53 top fishing countries were awarded a failing score. Another 16 were rated as ‘passable’. Why wouldn’t the police/international community care enough to follow through on their commitments? Well, one reason might be again revealed by the tragedy of West Africa, where the fish is caught illegally by European fishing vessels and sold in Europe (see the ‘West African’ link above). What about the value of the fish? 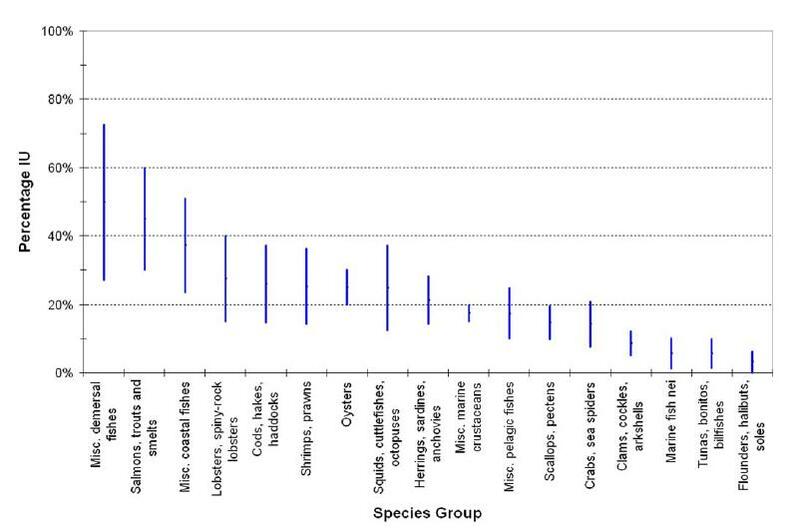 One kicker found in the Agnew et al paper is that high value fish species are not more likely to be fished illegally. That is, with the available data, the team found “no significant relationship between illegal fishing and the price of fish.” Of course, we might argue there are exceptions to this finding, most notably the Atlantic bluefin tuna back in 2006, but again there was also little political will. The navies and coast guards doing the patrolling were from the same countries as the fishing fleets doing the illegal fishing. What else could explain IUU fishing? Why such variation? Perhaps gear types? Life histories? Maybe traditional fisheries are resistant to regulation? The question of “why IUU fishing exists” is something I hope to explore more in the future. ** Agnew et al did not look at unregulated fishing which, by definition, would be very difficult to estimate. With that included, the IUU estimate could be even greater.